Up to 60% Off Standard Rates with Pre-Bookings at UK Meet & Greet Airport Parking The early bird gets the saving! Enjoy up to 60% off with pre-bookings at UK Meet & Greet Airport Parking. Parking from £4.50 Per Day at UK Meet & Greet Airport Parking Reserve your parking space online from just £4.50 a day and make your holiday as stress-free as possible. 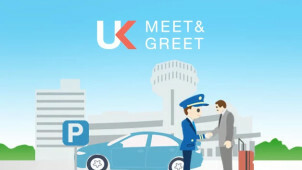 Meet & Greet Parking from £4.50 a Day at UK Meet & Greet Airport Parking No need to spend a fortune on meet & greet parking! Book through UK Meet & Greet Airport Parking from just £4.50 a day. 8 Days Gatwick Airport Parking from £25 at UK Meet & Greet Airport Parking Grab a great price on Gatwick airport parking at UK Meet & Greet Airport Parking! 8 Days Edinburgh Airport Parking from £28 at UK Meet & Greet Airport Parking Parking at the airport doesn't have to be expensive! Book through UK Meet & Greet for Edinburgh parking from £28. For the number 1 provider of a secure and efficient parking service - look no further than UK Meet & Greet Airport Parking. This is a fantastic option for when you've booked a family holiday abroad, romantic trip for 2 or perhaps a solo discovery trail. Now you needn't worry about bringing along your baggage - in all senses of the word - as you can drive peacefully to your departure airport, safe in the knowledge that you will be met on arrival by a chauffeur who will unload your bags before you pass the car keys onto them too. Your trustworthy driver will park your car in the car park you chose on booking, so you can simply step onto a courtesy shuttle bus which will take you straight to the terminal building so that you can start your holiday already feeling relaxed. The price promise at Meet & Greet parking means that you can be sure to only be paying the lowest prices for a quality service; alongside SSL certification, here you know that you're booking with a secure provider who will only make life simpler. Popular for the business traveller and even those with mobility issues too - with a chauffeur or valet parking option you can take any flight at any time because you'll never struggle getting yourself to and from the gate! With a host of Airport Hotels and Parking options too, plus airport lounges should you want a little more luxury - now you can even get that early morning flight and it's time to enjoy your journey like you should with a little help from the UK Airport Meet & Greet services. How do I use my UK Meet and Greet discount code? All of your discounts will be applied to your order total so you can sign in and checkout securely. Sign up to the UK Meet and Greet newsletter and you’ll gain great discounts immediately as well as access to news and any promotions that may be running. Where will my driver meet me? The majority of services will meet you at the airport car park, if otherwise you will be notified in your confirmation or by the driver. You should leave yourself sufficient if not more than enough time to drop your luggage if necessary and to check-in before your flight. Do check your flight details for more information. How can I contact the driver to let them know I am close by? We will have provided you with a number on your confirmation of the service provider you have booked with. How will I get to and from the airport? Each car park has a courtesy shuttle bus for customers to use to get to the airport. This is a free service and an integrated part of your booking. You will be given a number to ring by the car park to call on your return. Email: info@skyparksecure.com or send them a message here. If you want to cancel your booking, call 0345 4599 250 to request a refund. UK Meet & Greet Airport Parking ensures that your trip will be as stress-free as possible. You will be met at the airport by a fully insured chauffeur who will park your car for you so that you can head straight to the terminal gate that you require. Now you can save on convenient parking service with a UK Meet and Greet discount code. With a fast and easy online booking process - it’s easy to get your holiday or business trip off to an enjoyable start. Not only can you book your Meet & Greet service online but with a great selection of Hotels available to book too, this is truly breezy holiday planning. With 28 top UK airports offering Hotels with secure and convenient parking, now there's nothing getting in the way of that early flight, especially when you choose a stress-free parking discount code from UK Airport Parking. As one of the busiest UK airports, the meet and greet service at Heathrow is the best option to make life simpler when you're heading off on your holiday. For the family, business person or lone ranger - when you book with a UK Meet and Greet voucher code you can be sure to save yourself time, money and hassle. With expert services, let these guys take care of you and your car. They'll unload your bags, take care of the keys and then you're off with complete peace of mind to wherever you may be going.